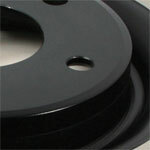 StopTech high quality blank rotors are a direct replacement for your vehicle. 125.39020 fits Volvo 850 S70 C70 and V70. StopTech Premium Rotors (formerly Centric Premium) are high quality blank, one-piece, direct replacement rotors used with your factory brake system. StopTech Premium rotors feature a durable anti-corrosion electro-coating for a distinctive look, and are manufactured under QS and ISO quality system standards. StopTech Premium Rotors feature several key advantages over stock rotors, including: electro-coating, Double Disc Ground, Machined Finishes, Split Castings and Mill Balancing. StopTech's Premium Rotors are also available in 125 Series High Carbon variants (part number prefix of '125'), featuring advanced metallurgy that greatly reduces the possibility of pad squeals when used with high friction, European style brake pad compounds. Unique Molybdenum and Chromium alloys available only to StopTech help resist cracking in high heat applications and increases friction for improved braking and stopping performance. StopTech Premium Rotors utilize an Electro-Coating finish that provides long lasting corrosion protection. Electro-Coating is an electrostatically applied finish that is designed to withstand 400 hours of salt-water exposure without rusting. StopTech Premium Rotors feature a double disc ground, taper free finish. Double disc grinding ensures parallelism, eliminates run out and provides near perfect disc thickness variation (DTV). Double disc grinding leaves a non-directional finish on the friction surface area for more effective pad-rotor break in. This finish also provides quieter and smoother stops. StopTech Premium Rotors feature 100% fully machined finishes, including rotor hats. In addition, StopTech Premium Rotors are also inspected for balancing and mill-corrected to a tolerance of less than 2 oz. per inch. This extra process provides better rotor balancing and creates a cleaner, more professional looking component. StopTech Premium Rotors feature O.E. style internal vane designs. This attention to detail ensures each StopTech Premium Rotor will function just like the original part. StopTech Rotors are priced and sold individually on our website.